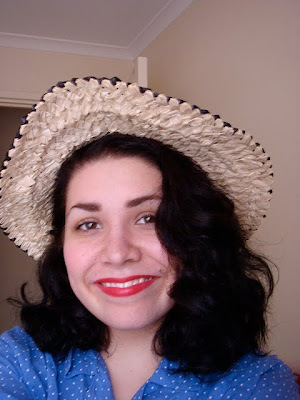 1940s/1950s straw hat, 15$ (was 20$ but I got it for 15$ on account of being me) from Red Ruby Vintage. 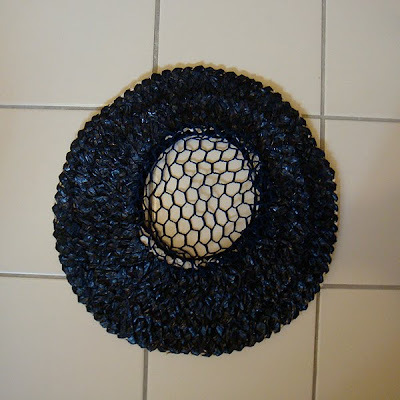 I think it would be a great hat to take on holiday, as it's totally flat! Alas, I can't see any holidays in my near future but hopefully one day I'll be able to take this hat on a trip somewhere. And here's a rather poor photograph of me wearing it. Are my eyes looking slightly wild? I think the stress is finally getting to my head. Wibble. And I look utterly miserable in this one! I was on my way to my Lindy Hop class, too. No one ought to look miserable when they're on their way to dance! Oh well. I was too lazy to change out of my lounging clothes and decided this was good enough to dance in. 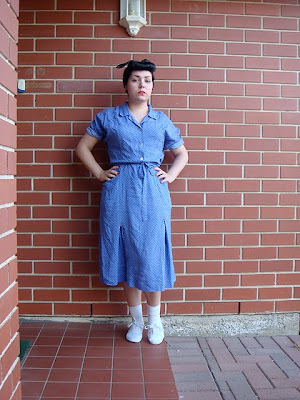 Outfit details: scarf - Salvos; earrings - Diva; dress - church op-shop; socks - ? ; shoes - KMart. Also, I've just realised I now have 200 'followers' (that really does sound far too cult-ish for my liking). Thanks to everyone who has read/supported this blog thus far. It really means a lot to me! what a great hat! And good luck with the final spurt of your degree! Lovely hat! Good luck with the degree! I love that hat! The mesh top is so cool. Good luck with finishing up your degree! What a super cute dress, my dear! Blue looks utterly gorgeous on you with your pretty, dark locks. 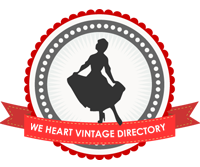 Thank you so very much for entering my vintage artwork giveaway - best of luck, sweetie! Miss Emmi: Aw, thanks, doll! Oranges and Apples: I love my hat. And thanks! Catherine: yeah, I thought the mesh was neat. And thanks!